When barrel fermentation ends, spent yeast cells settle to the bottom of the barrel and the wine begins to clarify. These yeast cells play an important part in the flavor, texture, and freshness of the wine. The lees absorb dissolved oxygen and keep the wine fresh, with or without the use of sulfur dioxide. When the lees are kept in suspension, they preserve the freshness of the wine, moderate oak extraction, and create texture in the wine. The process of distributing the lees in wine barrel is traditionally done via battonage, or stirring of the lees, with a stirring rod. 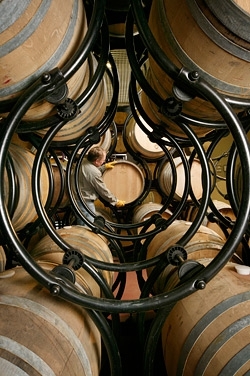 At Kenneth Volk Vineyards, we use an innovative racking system instead of battonage, to accomplish the distribution of the lees in the barrel. The OXO barrel racking system is a steel support structure where every barrel rests on four roller wheels. These wheels facilitate the ability to roll the barrel 360°. This simple design allows for rolling the barrel in place to distribute the lees into suspension throughout the barrel. By not having to remove the bung, less oxidation of the wine occurs, and less sulfur dioxide is needed to keep the wine fresh. In comparison to traditional battonage, no vortex is created from a stirring rod, and no cross-contamination from barrel-to-barrel can take place. The OXO system lessens the oxygen pick-up in the wine, and preserves delicate aromatics while moderating the extraction of oak. Over time, the process imparts a creamy texture to the wine and a seamless integration of wine and oak. Hundreds of barrels can be spun in a few hours, making lees suspension fast, efficient, (and fun)! The system, however, is not without its disadvantages. It is very labor intensive to load the racks, and it is impossible to move a full barrel out of the rack. Filling, racking and cleaning of barrels is one barrel at a time vs. the two at a time that is possible with typical modular two or four barrel fork-liftable racks. Despite the amount of effort required with OXO, we're enthusiastic with the results of this revolutionary system. And we have the biceps and creamy, fresh Chardonnays to prove it!